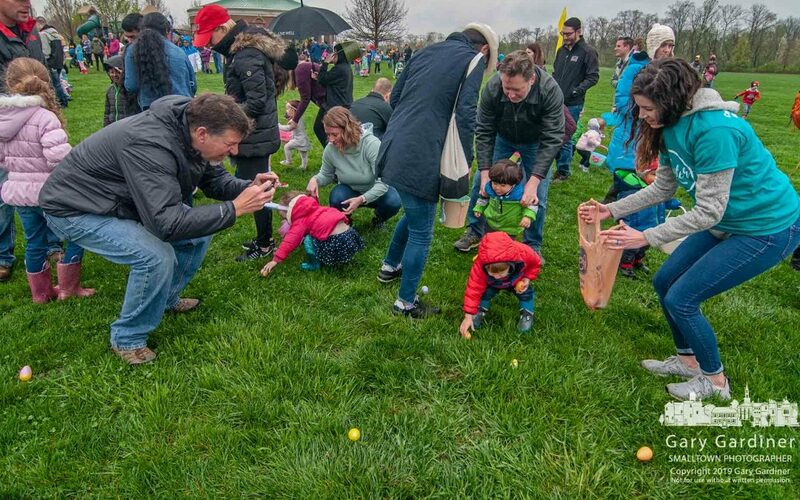 Parents assist and photograph their toddler stumbling across the sports field looking for plastic eggs in the annual hunt in Westerville on Easter weekend. My Final Photo for April 20, 2019. 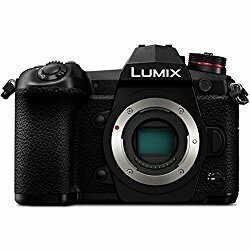 The Gear I'm Using And Used. 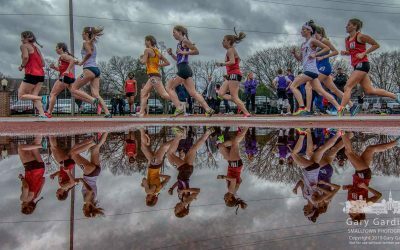 Runners round the first turn in the 5K at the Otterbein April Fools Invitational where runners navigated their way through track and field events with rain during parts of the afternoon. My Final Photo for March 30, 2019. 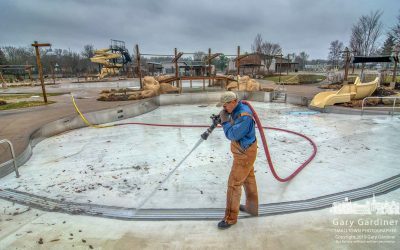 Highlands Pool Cleanup - A work crew hoses away the winter dirt and grime from the pools at Highlands as the city prepares to open it about two weeks early this summer. My Final Photo for March 29, 2019. 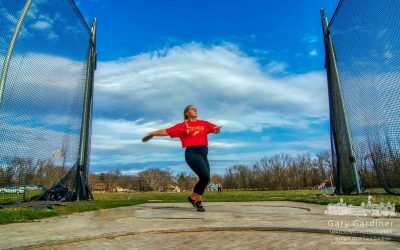 A discus athlete at Otterbein makes her last throws of the day in practice for the opening of the track and field season in two days. My Final Photo for March 28, 2019. 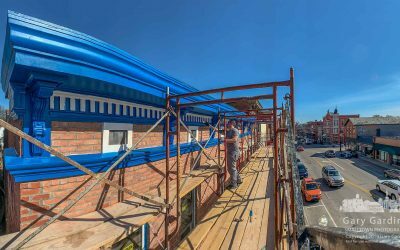 A painter applies a coat of blue sealer to the cornice and decorative molding before applying a darker color blue at the top of a renovated building on North State. My Final Photo for March 27, 2019. 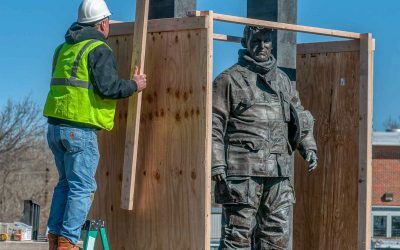 The firefighter memorial “The Crossing” at First Responders Park is protected with a wooden covering before it was moved into nearby storage as the park is rebuilt to add memorials to two police officers killed in 2018. My Final Photo for March 26, 2019. 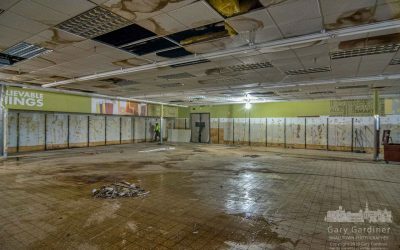 A construction worker clears debris from a corner of the old Aldi store at Glengary Shopping Center as the owner begins refurbishing the building for a Dollar Tree store. My Final Photo for March 25, 2019. 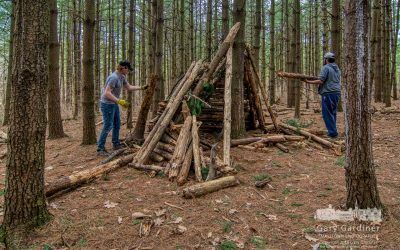 A pair of amateur housebuilders dismantle the primitive structure they built in the pine woods at Hoover Dam after a park ranger told them it was not permitted to construct such structures in city parks. My Final Photo for March 24, 2019. 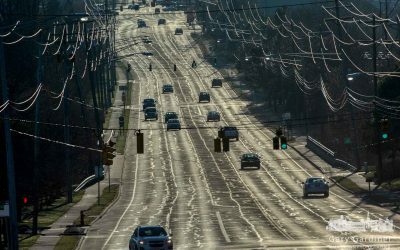 Early morning light glistens off West Schrock Road as people head off to work, shopping, sports, and a busy weekend. My Final Photo for March 23, 2019. 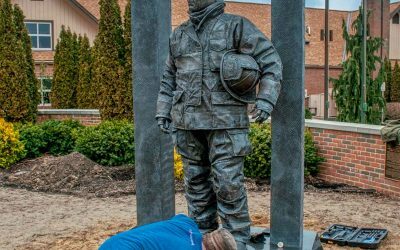 A worker begins the process for moving “The Crossing” firefighter statue from its mount in First Responders Park as the city parks department begins construction of a new park adding the names of two police officers who were killed in 2018. My Final Photo for March 22, 2019. 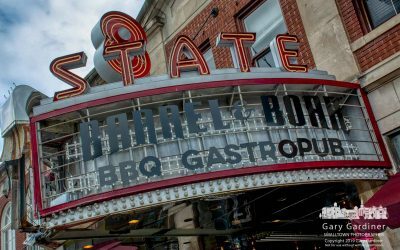 The LEDs that illuminate the 8 State marquee can be seen after workers removed the iconic sign’s translucent panels as repairs begin on the damage from a box truck hitting it last year. My Final Photo for March 21, 2019. 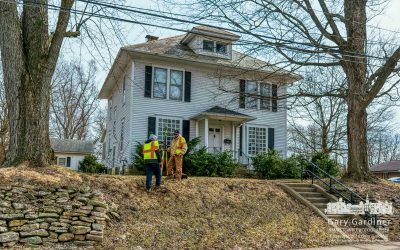 Surveyors mark the location of underground natural gas lines leading to two houses on South State Street where a developer was approved to demolish the buildings, clear the property of trees, and build an office and apartment complex. 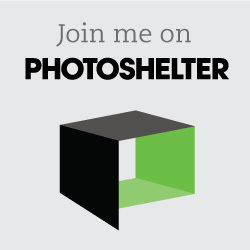 My Final Photo for March 20, 2019. 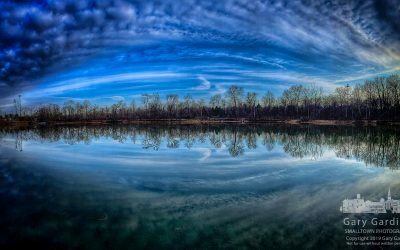 Early morning clouds glide over Otterbein Lake after unexpected snow earlier in the week reminded everyone that Spring was still a few days away. My Final Photo for March 19, 2019. 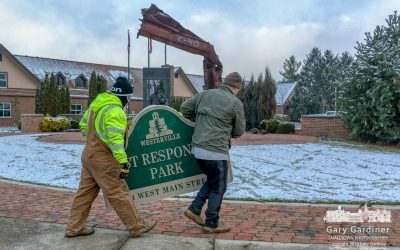 Westerville Parks workers remove the First Responders Park sign as contractors prepare to expand the original park to add a memorial for the two police officers killed in 2018. My Final Photo for March 19, 2019. 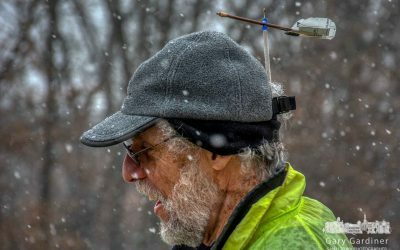 A sailor temporarily stores his mast pennant in the rear of his ballcap as he rolls up his mainsail at the end of an afternoon sailing on Hoover Reservoir. My Final Photo for March 17, 2019. 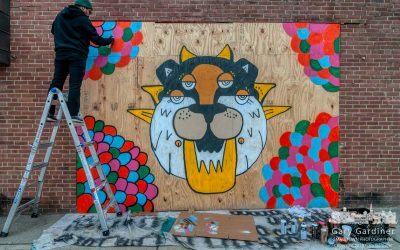 An artist spray-paints a rendering of the Crew Cat on plywood covering the window in the front of Jimmy V’s that was destroyed in a car crash earlier in the week. My Final Photo for March 16, 2019. 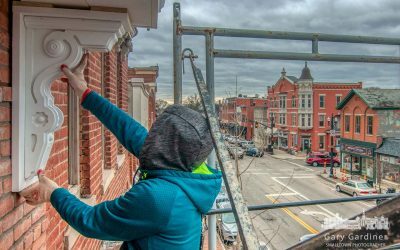 A carpenter checks the alignment for a section of cornice corbel he’s set to install across the top of the renovated facade at 46-48 North State Street in Uptown Westerville. My Final Photo for March 15, 2019. 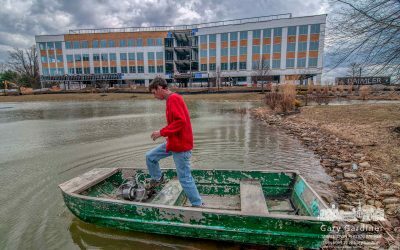 An electrician steps to the bow of his flat-bottom boat where he stores the new LED lights he will install at the fountain in the holding pond between the Renaissance Hotel and the new DHL building under construction at Westar. My Final Photo for March 14, 2019. 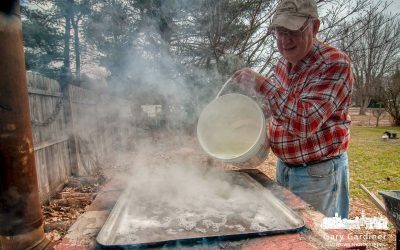 Bernie Woller pours fresh sugar maple sap into his wood-fired brick and concrete block evaporator where he will end up with more than six gallons of maple syrup from 250-plus gallons of sap collected from the trees in his yard. My Final Photo for March 13, 2019. 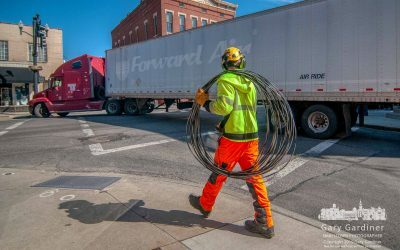 A city electric worker carries away a low-hanging power cable torn from its anchor when it was struck by a truck turning onto State Street damaging the traffic signal and closing the street for several hours for repairs. My Final Photo for March 12, 2019. 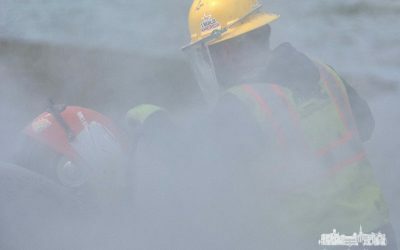 A construction worker is obscured by a cloud of concrete dust as he cuts a section of storm sewer pipe as the city extends Altair Parkway near the DHL building construction site. My Final Photo for March 11, 2019. 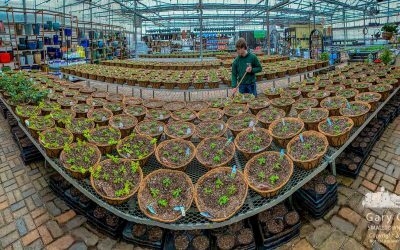 The beginning of Hoover Gardens’ spring baskets line portions of the greenhouse tables as the company prepares for customers who favor early plantings before the warmth of summer. My Final Photo for March 10, 2019.